Check Out the Updated CIS – Corridor Info System! “CIS” stands for “Corridor Info System”, an interactive tool developed within the CODE24 project. The central purpose of the CIS tool is to give strategic information about the Rhine-Alpine Corridor’s development. Overviews of many planning-relevant themes are easily and quickly available for the interested parties. CIS is designed as an essential base of transnational cooperation in future actions. The EGTC continues maintaining the CIS as a dynamic tool. SiTI – Higher Institute on Innovation Territorial Systems as a member of the Advisory Board of the EGTC kindly provides hosting and technical management of the CIS tool. Check out the updated CIS tool here! The Interregional Alliance for the Rhine-Alpine Corridor EGTC met on 11 April 2016 inNovara/Italy for its 3rd Assembly meeting. One prominent guest speaker was the EU-Corridor Coordinator for the Rhine-Alpine Corridor, Paweł Wojciechowski who underlined the importance of the new Interregional Alliance. Together with the Chair of the Interregional Alliance for the Rhine-Alpine Corridor EGTC, Conny Bieze, it was agreed to coordinate their work for the development of this most important European transport axis, by joining forces and bringing in their mutual interest both, from the European and regional perspective. Both, the further development of EU corridor work plan until 2018 and of the joint corridor strategy of the EGTC benefit from such cooperation. Professor Scholl from the ETH Zurich and Professor Drewello from the University of Applied Sciences Kehl provided significant input to the further development of a sustainable corridor development strategy. This major European corridor should demonstrate as a best practice the will to cooperate and to compete with other transport corridors in the world. Since its founding in April 2015, the EGTC has prepared or supported several project initiatives that contribute to its joint strategy – for example the CEF projects ERFLS and RAISE-IT or the initiatives on IT based capacity management and LNG for heavy duty transport. The EGTC Assembly meeting in Italy came just in time after the decision of the North-Italian Regions Liguria, Piedmont and Lombardy to jointly develop the transport infrastructure and the revitalization of the North-West Italian logistics. The meeting in Novara can be seen as a starting point of a close working relationship between the European Commission and the regions gathered in the EGTC! The Assembly also agreed the accession of four new members from Italy, The Netherlands and France. The EGTC has submitted its first project proposal in the CEF Transport Call 2015 under the priority “Urban Nodes”. The study action is called “Rhine-Alpine Interregional Seamless and Integrated Travel Chain (RAISE-IT)”. The basic content is a multi-scale accessibility approach in important TEN-T urban nodes of the Rhine-Alpine corridor that promote the seamless connection between urban and TEN-T long-distance passenger services. Conny Bieze, Chair of the Interregional Alliance for the Rhine-Alpine Corridor EGTC and Vice Governor of the Province of Gelderland, invited the EGTC members and representatives of the European Commission to the second Assembly meeting on 9 November 2015 in Berg en Dal near Nijmegen in the Netherlands. It was the first regular Assembly Meeting six months after the founding of the EGTC. 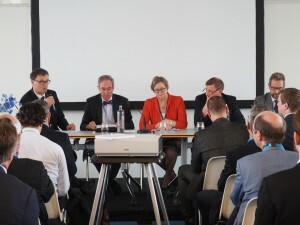 Herald Ruijters, responsible for the Trans-European Network within the Directorate General Mobility and Transport of the European Commission, expressed his full support of the work of the EGTC. He invites the EGTC to take an active role in the planned update of the Work Plan for the Rhine-Alpine Corridor. 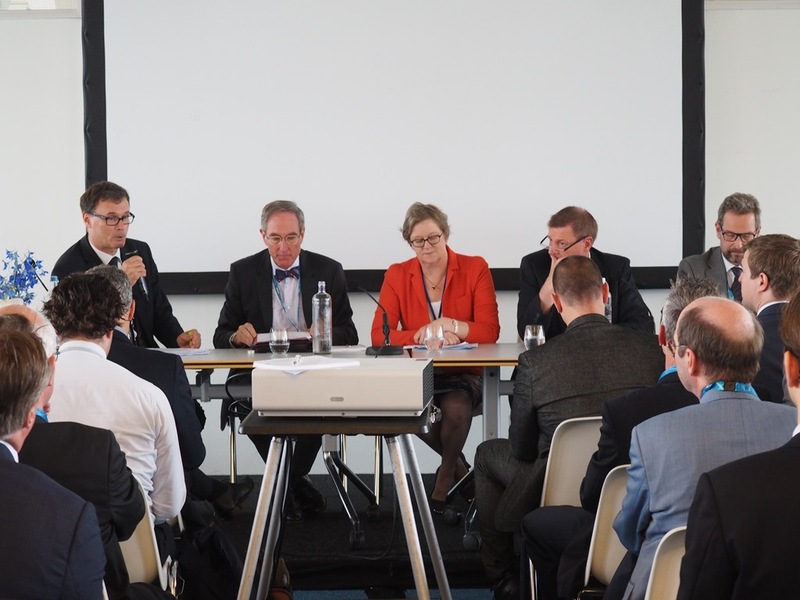 He also offered that the EGTC as an important stakeholder of the Rhine-Alpine Corridor should play an active role during the TEN-T days 2016 in Rotterdam. 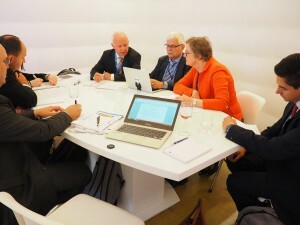 As for funding opportunities, he referred to the recently published 2015 Call for Proposals under the Connecting Europe Facility. There, especially the priorities “Urban nodes” and “Multimodal logistics platforms” offer opportunities for interregional cooperation projects. Łukasz Wojtas, Policy Advisor of the Corridor Coordinator Paweł Wojciechowski, pointed out that he sees the EGTC as the most important stakeholder in communicating on transport issues to local citizens on the one hand and to the European Commission on the other. 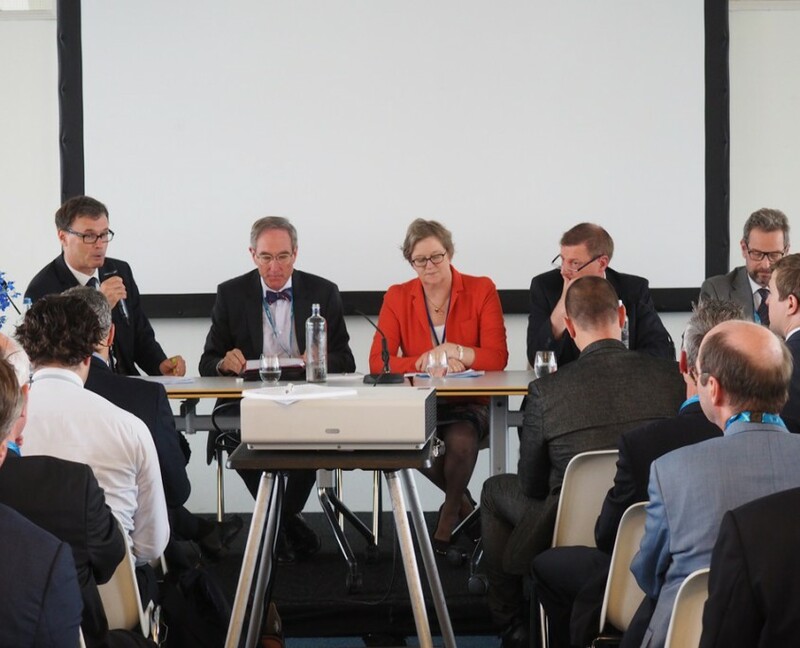 Conny Bieze underlined the role of the EGTC as “Corridor Ambassador”, bringing together the regional view from the perspective of the citizens and the European TEN-T policy. The Assembly welcomed three new members – Port of Antwerp, City of Mainz and Canton Basel-Stadt to the EGTC. Thus, the EGTC now consists of 16 members from 5 countries – the Netherlands, Belgium, Germany, Switzerland and Italy. Further potential members from all countries from along the corridor are in negotiations to join the EGTC. Thus, the EGTC gives more and more regions a strong voice on the European floor. The internationally composed board of the EGTC is now complete with the newly elected Vice Chair, Paolo Balistreri, General Secretary of Confindustria Piemonte in Italy. The Managing Committee, consisting of Conny Bieze as Chair, Birgit Simon as one of the two Vice Chairs and Jörg Saalbach as Director of the EGTC, is now complete. The Assembly discussed the work plan of the EGTC and first concrete project ideas for the coming years. The members discussed to cooperate for instance in projects on LNG deployment for trucks, integrated time tabling for passenger transport, on borderless autonomous driving and a “corridor capacity platform” for multimodal freight matching. Finally, Conny Bieze and the participants visited project sites in the Province of Gelderland. Exemplary for integrated sustainable planning is the project for flood protection at the river Waal in Nijmegen / Veur Lent. The Assembly also visited the river control centre of Rijkswaterstaat. The German Inttereg blog run by the Federal Institute for Research on Building, Urban Affairs and Spatial Development (BBSR) within the Federal Office for Building and Regional Planning (BBR) interviewed the Managing Committee of the Interregional Alliance for the Rhine-Alpine Corridor EGTC. The blog post is published in German and is available here: http://blog.interreg.de/blog.html. 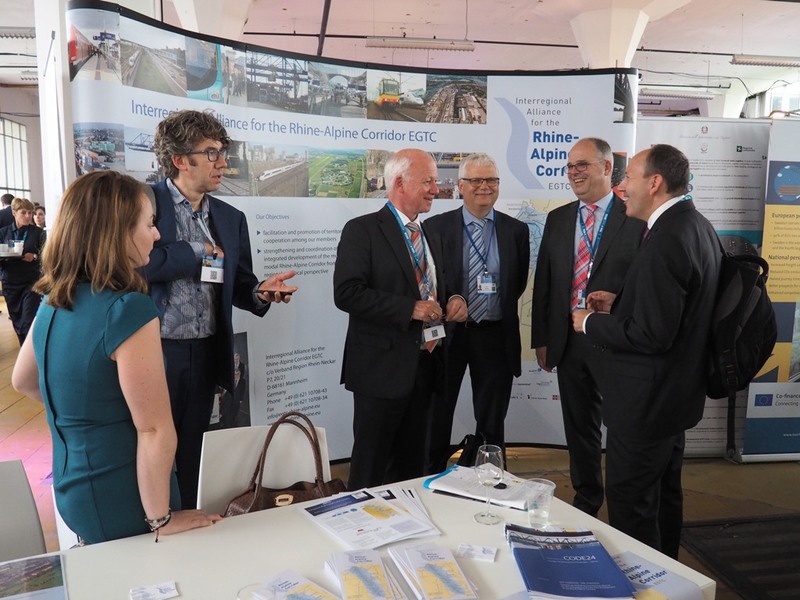 In May 2015, the Assembly approved three new members to the Rhine-Alpine Corridor EGTC: Port of Rotterdam Authority, Regione Piemonte and Uniontrasporti! The new members have a great motivation to join the EGTC as they expressed. The founding members warmly welcome the new members and look forward to a successful cooperation! On 24 April 2015, the “Interregional Alliance for the Rhine-Alpine-Corridor EGTC” has been founded in Mannheim. Thirteen founding members from Italy, the Netherlands and Germany have signed the Convention. The development strategy for the Corridor which has been jointly elaborated during the project CODE24, the findings gained as well as the corresponding measures and actions shall now been implemented with joined forces by the EGTC. In this context, it is essential to focus on the better and more efficient use of the existing infrastructure and the upgrading or construction of transport capacities for goods and passengers. At the same time adequate measures for the improvement of living conditions – especially noise protection – are on the agenda. By the establishment of the EGTC, the close coordination of its members shall be guaranteed for the future. It is crucial to facilitate the consideration of local and regional interests when developing this most important European Corridor. Among the first concrete activities of the EGTC it is planned to apply at least for one new EU-funded project; first ideas for projects will seamlessly tie in with the results gained with CODE24. At its founding meeting on 24 April 2015, the assembly elected the internationally composed Managing Committee. The Deputy on Transport of the Province of Gelderland (NL), Conny Bieze was elected as the Chair. The Deputy Director of the Regionalverband FrankfurtRheinMain (DE), Birgit Simon was elected as the Vice Chair. As Director of the EGTC, Jörg Saalbach from the Verband Region Rhein-Neckar has been appointed. The joint secretariat will be hosted at the premises of the Regional Planning Association Rhein-Neckar in Mannheim.